Orange Blossom Water Turns Five ! 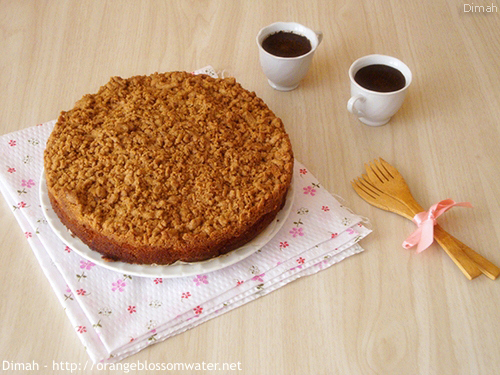 This cake is moist with delicious crumbling streusel topping. Everyone loved it. Today my blog celebrates its fifth birthday. I remember when I chose the name of the blog and when I published my first post (Batersh). My aim was to spread Syrian cuisine to the world, and still have many recipes want to share with you but the last three years have been tough on me due to the situation in Syria, that’s why I couldn’t update the blog frequently. For this celebration, my plan was to make a feast full of Syrian dishes, but unfortunatly I couldn’t do that because I’ve been sick since last week. I changed my plan and prepared this easy delicious German Apple Cake. For the recipe of the cake read this post. Thanks everyone for following Orange Blossom Water.